Your church should be a blessing to its community. You know that. In my current church, we are still looking for ways to bless our community. Our outreach will look different than yours. Our resources are different than yours. Our life patterns (working hours, commuting patterns, gated communities, social classes) are different than yours. But every church, no matter the size of active membership, should be a blessing to its community. 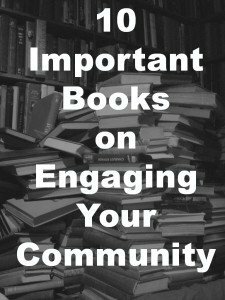 If you are looking to refresh your church’s vision for community service, here is a small biography of books I’ve read that can lead you in thinking and evaluating your outreach. A Field Guide for the Missional Congregation is organized around seven transformational keys, using real-life case studies to illustrate each key. I really enjoyed the discussion questions after the end of each chapter. Reading this book was both challenging and encouraging. The authors are practitioners in the of ministry. It is clear that they “get it.” This book speaks more to the practice of missional community versus theology of missional practice. Much of their stories reflect their own experience in developing their church. Read my review here. Learn from churches that have made serving their communities a priority–with dramatic results. Your church can be a firm pillar in your community because of the unwavering truth and love of its members. I loved this book and need to write a review. Following up on their first book, they elaborate on their phrase: “Good deeds to good will to good news.” They write: “Becoming an externally focused church is not about becoming the best church in the community.” They center the book around nine big missional concepts that need to be addressed” – focus, purpose, scope, missions, partnering, evangelism, systems, creativity, and outcomes. The externally focused church asks “How can we be the best church for our community?” I have used this question over and over in many conversations since I read this book. A megachurch decides to start blessing it’s community and how they partnered with existing non-profits. Sweney shares their first hand experience in leading a mega church that had been based solely on attractional ministries into serving it’s community. While written out of a megachurch experience, the principles they uncovered can be used in a smaller context. This book is not aimed directly at community service, but rather looks at the question of discerning what is God saying to your church about serving its community. Many churches will find something to get excited about, but the principles in this book will help your church discern where God is calling it to serve, rather than seize whatever is the passion of the month. Read my review here. The church planter author talks about his own wounds — his dream church plant, a multi ethnic congregation that busted him up over underlying tensions over how to do church. He was jaded, dropped out of ministry for a few months, until he talked with some jaded Sojourners (Their term for seekers, spiritually disoriented God seekers), in a bar shortly after 9/11. Out of that came ideas and thoughts about how to step out of the attractional form of doing church and actively blessing the community. O’Dell is the pastor who took a barely surviving Southside Baptist church with 11 people in the choir and 26 people in the congregation and led it on a journey of growth and community service. Church members are often hungry to make a difference in their community, yet most don’t know where to start. Hatmaker takes you on his journey of how he helped his church move start ‘serving the least.’ It should be on your must read list for next year. I’m looking for new books to read along these lines. What would you recommend? Add your selection in the comment field below.